Since 1978 Duke Golf School has been a part of the Duke University for rising golfers. Whether you aim to be a collegiate golfer or you just love the game and want to learn more, we provide an atmosphere in which each student will grow in their knowledge and enjoyment of the game as well as make lasting friendships and unforgettable memories. While in attendance, each student will have unlimited access to the University's private varsity golf team practice facilities, including the renowned V-1 Swing Analysis Program and Trackman doppler radar system (for live ball flight club and movement analysis), as well as a SAM putt-lab performance station. 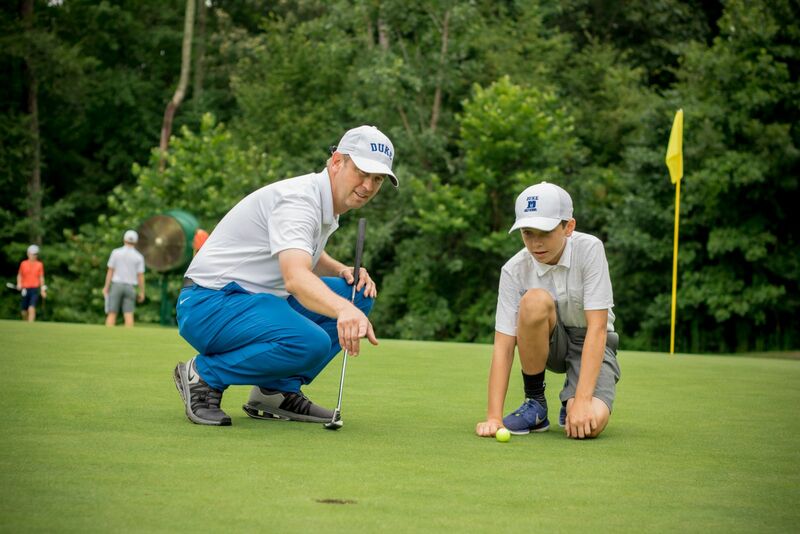 Taught by College Golf Coaches, Class A PGA Professionals, and Collegiate Student-Athletes, golf camp participants will gain insight about the game at every stage of development from beginner to high-level amateur & professional. Sessions will include insight on competing in junior golf, incorporating valuable practice techniques, and understanding the importance of nutrition for competition. Lessons will also include detailed instruction on every aspect of the game from holing short putts to blasting long drives. Duke Golf School also offers the unique opportunity for campers to experience a taste of college campus life and learn the game from Division I, II, and III college coaches and players.